Impressions of an ex-patriate bank manager of a pivotal time in the history of Hungary. 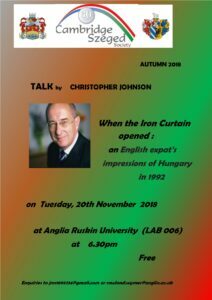 Date and Location: On November 2oth at Anglia Ruskin University (ARU) LAB 006, at 6.30 pm. Entrance Free, all welcome. 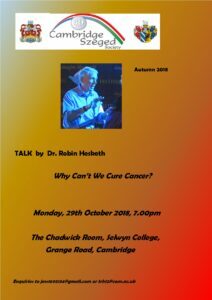 TALK: ‘Why can’t we cure cancer?’, by Dr Robin Hesketh. Renowned researcher and author on cancer, Dr Robin Hesketh, presents his latest findings. 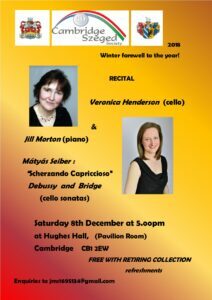 At Selwyn College (Chadwick Room) on 29 October at 7 pm. Entrance free, all welcome. 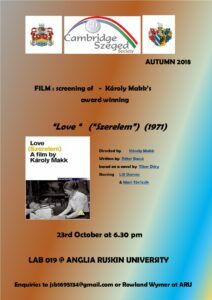 Award winning film by Hungarian director Karoly Makk. Screened at the Anglia Ruskin University (ARU) on 23 October at 6.30 pm , at the LAB 109 (not 019 as on poster). Entrance free, all welcome.